Country star Tim McGraw held a ribbon cutting ceremony for his new gym TRUMAV Fitness in the Gulch. 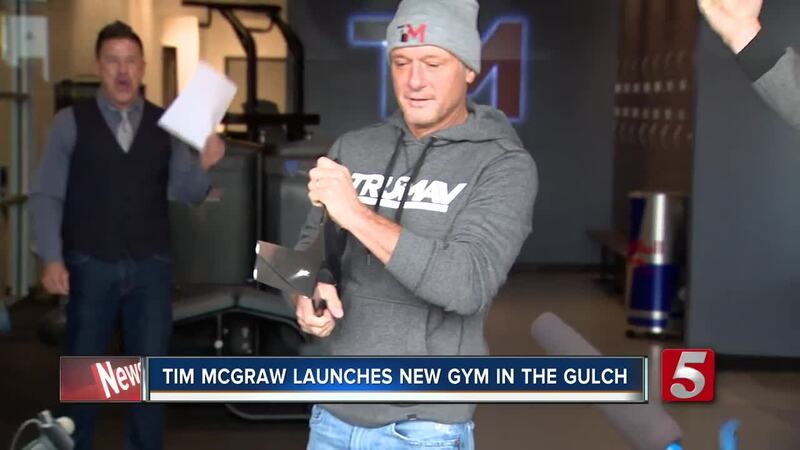 NASHVILLE, Tenn. (WTVF) — Country star Tim McGraw held a ribbon cutting ceremony for his new gym TRUMAV Fitness in the Gulch. The boutique gym in downtown Nashville offers full-body high intensity workout classes. Tim McGraw said his workout routines while on the road inspired him create the gym. McGraw partnered with Snap Fitness to develop the TRUMAVFitness club franchise. The flagship club is located in Nashville's Gulch neighborhood at 603 9th Avenue South and is owned and operated by fitness entrepreneur Wirth Campbell. He said his fitness journey began after his daughter saw him in a movie, and thought he looked a little overweight. The grand opening party is scheduled for 6 p.m.-9 p.m., and will feature music by Donnie D, food, drinks from Red Bull, Diskin Cider and Deep Bay Spirits, a silent auction benefiting Make-A-Wish with a McGraw-signed Taylor Guitar, giveaways and gift bags for the first 50 guests. All events are open to the public.